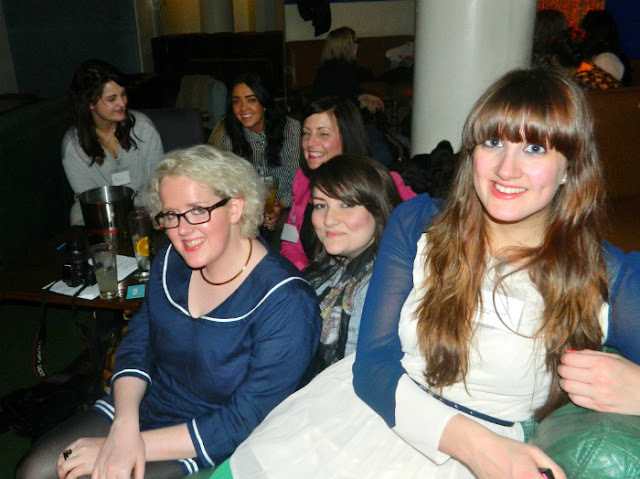 I never take any photos when I go to blogger meetups and ldnlunch was no exception. I was far too busy chatting and drinking cocktails to take photos so I waited for these ones to surface. It was lovely to just meet up with people I speak to on a daily basis on twitter and have some lunch. No big event, just some drinks and good conversation. Perfect. I travelled down to London with the lovely Lowri from Cardiff and we met up with a big group in Topshop for a bit of retail therapy. I manged to resist and only bought some body glitter for the party I was going to in the night and a huge Lola's cupcake in Selfridges to eat on the train back. I love this photo of me Lowri and Sarah that Sophie took. I love spending time with Sarah, I pester her most days with links to dresses and moan to her about Weight Watchers. Sarah is the best! I want to say a big thank you to Eloise, Sophie and Claire for organising the whole day, it really was lovely. I got back to Cardiff that night at about 9.30 and got changed straight away and went to a house party an hour later, bit of a long day! The party had a 90s theme so I did my best impression of Nicky Wire (from the Manic Street Preachers) and went wild on eyeliner, glitter and leopard print. aaw thanks, I did really enjoy wearing the glitter. I wish it was socially acceptable to wear it everyday! LDN Lunch looks like lots of fun! Wish I'd been in London that weekend and able to come along! It really was so nice to meet you Gem! there's nothing better than a girly day out! Love the Nicky Wire effort! !